FOX has released the synopsis for the April 18 episode of Brooklyn Nine-Nine, "Serve & Protect". Nathan Fillion (Castle), Greg Germann (Ally McBeal) and Kimberly Herbert Gregory (Vice Principals) guest star in the episode. Terry's ex (guest star Kimberly Herbert Gregory) replaces Teddy in evaluating the precinct, but Jake and Rosa are distracted by a burglary case that occurred on the set of one of their favorite detective TV shows. 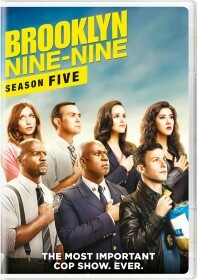 As the rest of the Nine-Nine concentrate on the audit (and Terry's past relationship strategies), Jake and Rosa pass time with the series star (guest star Nathan Fillion) and producer (guest star Greg Germann), who meddle in the case and charm Jake with the glamour of show business in the all-new "Serve & Protect" episode of BROOKLYN NINE-NINE airing Tuesday, April 18 (8:00-8:31 PM ET/PT) on FOX.